It's less than 24 hours since the fall primary election ended and the winning candidates are already eyeing the general election in 83 days. 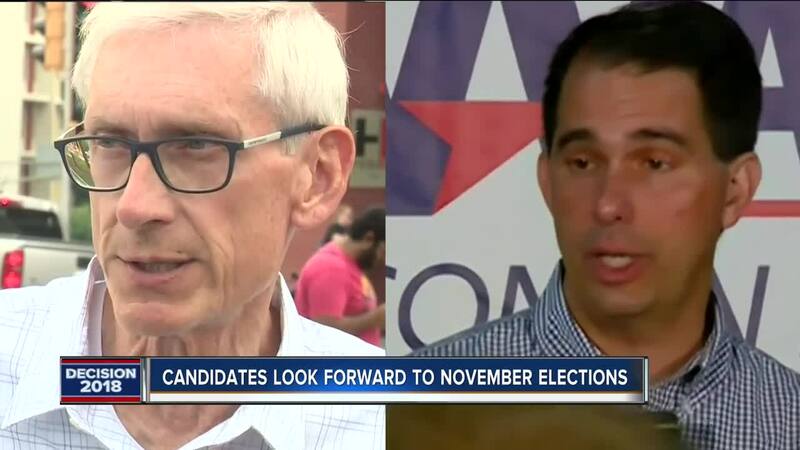 In the biggest match-ups, Governor Scott Walker will face Tony Evers in November. The two men spoke at different places across the state Wednesday. Scott Walker laid out a four point plan in continuing Wisconsin's momentum. He wants to move apprenticeships to be available to 7th and 8th graders, offer a $5,000 tax credit to Wisconsin college graduates who stay in Wisconsin for work, a tax credit for senior citizens to be able to keep and afford their homes and another tax credit for working families to be able to re-enter the workforce. "The challenge going forward, how do we move forward that allows employers to find the talent to fill that workforce and keep Wisconsin moving forward?" Walker said. "That's really the choice. Do we want to move forward or take a giant step backwards?" Evers met with Lt. Governor candidate, Mandela Barnes. He says the two men spoke at length this morning for the first time, though they have spoken in the past. Evers did not go in depth into his plan if he becomes governor but says he'd look at everything from removing tax credits, adding toll roads or even gas taxes. He says everything is on the table. But with 83 days to go until the general election, both men took a chance to explain why their opponent is not fit to take office. "[Walker] has made promises he hasn't kept in the last eight years," Evers said. "He spent most of his time breaking those promises. Whatever he's proposing pales in comparison to the destruction he's done for the people of Wisconsin thus far." "Over the last few years, we put more actual dollars in K-12 than ever before in the history of the state," Walker said. "Not just to be pro-education, or as my opponent said, pro-kid. He called my budget a pro-kid budget when he wasn't a candidate running for governor. He kind of changed his tune now. I guess that's what happens when someone becomes a politician. They say one thing one time and something different another." Governor Walker challenged Evers to a debate leading up to the election. In the Senate, a contentious battle is brewing between Senator Tammy Baldwin and the Republican nominee, Leah Vukmir. Vukmir topped Kevin Nicholson in the primary despite a highly funded effort by Nicholson. She's calling on her conservative record and endorsements from the Wisconsin GOP and prominent GOP Officeholders including House Speaker Paul Ryan. However, it's one endorsement she'll be boasting that came in over Twitter. President Donald Trump tweeted his support and endorsement for Vukmir after her victory last night. Baldwin, the first openly gay US Senator, is a supporter of marriage equality and LGBT issues. She released a statement after Vukmir's victory saying, "Wisconsinites want someone who will be in their corner and stand up to powerful special interests in Washington, not a bought-and-paid-for Senator. Leah Vukmir has a long record of putting her corporate special interest backers ahead of hardworking Wisconsin families, making the choice clear this November." Baldwin also called on Vukmir to join her in a televised debate. The debate will be aired on TODAY'S TMJ4, moderated by anchors Charles Benson, Shannon Sims and WUWM's Mitch Teich. A date and time are to be determined.